Though it is one of the smallest regions in the country, Umbria has been called the “green heart of Italy”, referring to the area’s nearly year-round lush green hills as well as the region’s location. Centered between the Adriatic and Thyrrhenian Seas, the region is landlocked and has long been bordered by powerful kingdoms and regions. Settled first by the Umbri tribe in the 6th century BC, the Etruscans soon took control of the region; though the Umbrians rose up and drove the Etruscans out, despite a valiant fight against the powerful Roman Empire, the Romans eventually gained control of the region. The Byzantines and Ostrogoths fought over Umbria once the Roman Empire fell and, after the Lombards gained a foothold followed by a brief reign of the Franks, the French Revolution brought first the Roman Republic to power and then Napoleon. The region eventually joined the Kingdom of Italy in 1860, establishing Umbria’s place as the heart of Italy. Often overshadowed by neighboring Tuscany, Umbria’s lovely rolling hillsides, dense forests, medieval castles and verdant farmlands make it one of the most picturesque regions in Italy. 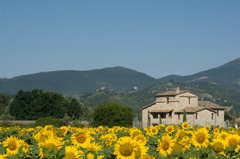 And because the tourists flock to the more popular Tuscany, Umbria remains unspoiled and far less crowded, providing an authentic and relaxed environment. The cuisine is wonderful, utilizing the local harvest of lentils, cheese, olive oil and black truffles, a regional delicacy. Umbria is also renowned for several superb vintages; Torgiano, Orvieto and Sagrantino di Montefalco are all popular and delicious local wines. While Umbria’s most popular and sacred destination is the stunning town of Assisi, one of the region’s hidden treasures is the small town of Bevagna, one of three villages in the Valle Umbra well worth exploring. With neighboring Montefalco and Spello, these historic towns contain remarkable Roman architecture, stunning artworks as well as fabulous vineyards. From its lush and lovely landscapes to its culturally significant art collections and ancient monuments, Umbria’s quiet character offers a unique perspective into Italian life. Found almost precisely at the center of the country is Perugia, an appropriate location for the capital of Umbria, the “green heart of Italy”. One of several cities in the Tiber River Valley, Perugia was first settled by the Umbrians and then controlled with great success by the Etruscans. After falling to the Byzantine Empire, the walled city was ruled exclusively by the Papacy until a public revolt ousted the vicar-general in 1375. 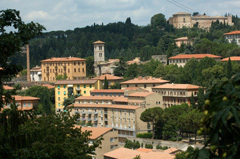 Perugia entered a tumultuous period marked by bitter clashes between the parties representing the people and the nobles, culminating in several violent and bloody battles. Eventually the city fell to the French, then briefly to the Romans, before finally joining the Kingdom of Italy in 1861. Renowned for its educational institutes, including the Italian language school Università per Stranieri, or Foreigners University, the Perugia Fine Arts Academy and Perugia Music Conservatory as well as the Universita degli Studi and the renowned Universita dei Sapori (University of Tastes), Perugia is both a cultural and artistic center. The Galleria Nazionale dell’Umbria houses a remarkable collection of artworks, including works by the renowned Renaissance artist Agostino di Duccio. Renaissance painters have a strong affiliation with the city, most famously Pietro Vannucci, also known as Perugino, who later became teacher to Raphael, perhaps the most famed Renaissance artist. The Palazzo dei Priori (Town Hall) features frescoes by Perugino and is one of Italy’s most renowned structures. There are numerous churches and abbeys to explore, including the Basilica of San Domenico, home to the tomb of Pope Benedict XI, the Church of San Pietro, which houses wonderful paintings and frescoes by Perugino, Raphael and others, and Perugia’s most famous church, the Cathedral of San Lorenzo. A stunning architectural monument that took nearly a century to complete, the Cathedral faces the Palazzo dei Priori and the Fontana Maggiore, a famed medieval fountain, and contains a fascinating museum, statues, mosaics and priceless religious artifacts. 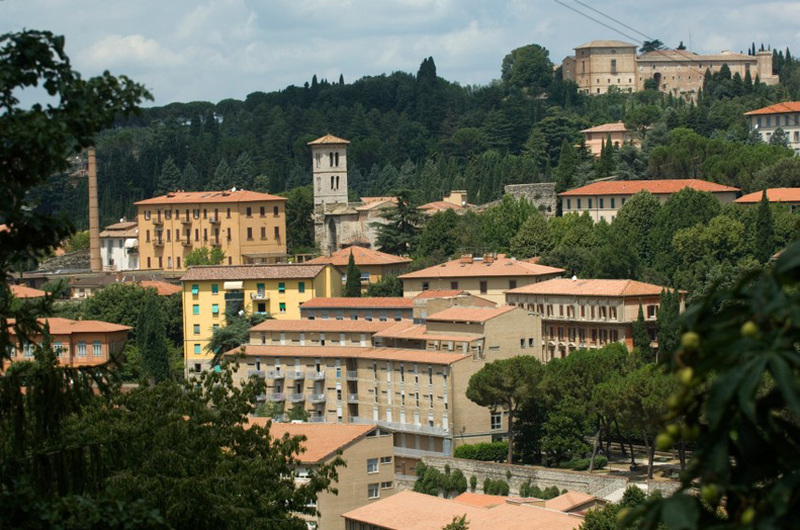 Perugia’s numerous squares, fountains and architectural gems, its lively streets and cultural events, such as the annual Umbria Jazz Festival in July, make this a historically fascinating and spirited destination. 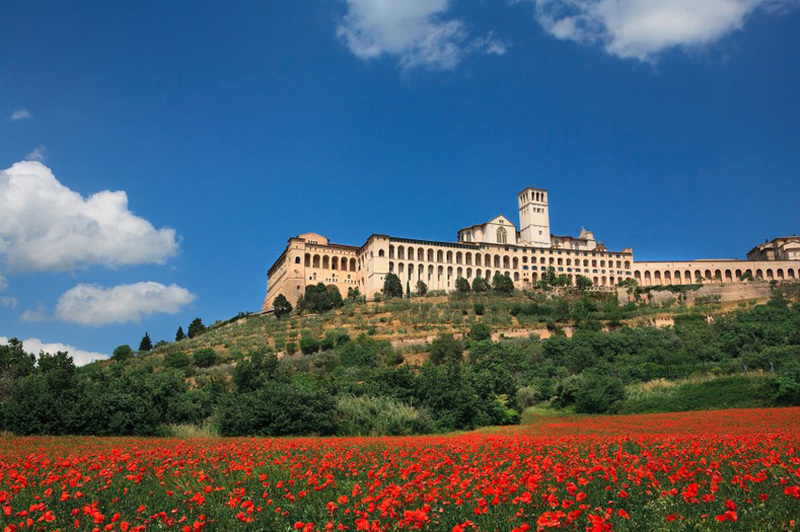 The famed birthplace of Saint Francis, Assisi is a small, picturesque town located 144 kilometers (90 miles) north of Rome and 19 kilometers (12 miles) east of Perugia whose population of 3,000 plays host to nearly five million tourists every year. Settled by the Umbrians in 1000 BC, Assisi began as a small hillside settlement, eventually taken first by the Etruscans and then by the Romans in 295 BC. Vestiges of this period of Roman rule can still be found throughout the city, including the walls to the city. After facing near destruction by the Ostrogoths, the Lombards took control and the city grew to independence during the 11th century. However, during this period Saint Francis was taken prisoner during one the many battles with the Guelphs, which led to his path of life as a beggar and eventually to establishing his Franciscan order. 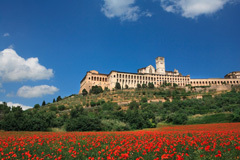 Assisi continued to grow and expand during the 13th century until the plague decimated the city’s population in 1348. Eventually enveloped by papal rule under Pope Pius II, Assisi flourished, marked by the creation of several significant architectural monuments, including the Basilica of Santa Maria degli Angeli. Though the two earthquakes of 1997 caused damage to the city, the rehabilitation of many of the historical landmarks, including the Basilica di San Francesco, has been completed. The Franciscan monastery, the Basilica di San Francesco, is Assisi’s most revered landmark, protected as a World Heritage Site. Built to honor Saint Francis, the stunning and grand church is an interesting tribute to a man who preached the virtues of living simply. The basilica’s deep spirituality and exceptional architecture and artwork draw millions of visitors each year. There are many other lovely churches and cathedrals throughout Assisi, including the town’s first church, Santa Maria Maggiore, the Basilica di Santa Maria degli Angeli, which contains the spot where Saint Francis died, and the Chiesa Nuova, built on the foundation of Saint Francis’ birthplace. The Basilica di Santa Chiara, or Saint Clare’s, houses the tomb of Saint Clare, friend and protégé of Saint Francis, and is a remarkable example of early Gothic architecture. Beautiful, narrow lanes and wonderful vantage points, such as the medieval castle Rocca Maggiore that sits above the town and provides a perfect view of Assisi below, make the town a great place to wander and explore. The Pinacoteca Communale, Assisi’s art gallery, houses a wonderful collection and is located along the town’s lovely main street, Via San Francesco. This quiet, walled hillside town is both a spiritual and cultural destination well worth visiting. Situated 100 kilometers (62 miles) north of Rome and 120 kilometers (74 miles) south of Florence, Orvieto is easily accessible; however, the breathtaking location of the town makes it appear just the opposite. Built on a tuff of volcanic rock 300 meters (984 feet) from the ground, the walled city looks both precarious and alluring. 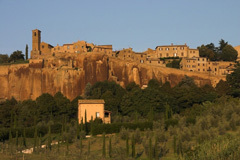 Settled by the Etruscans, Orvieto was ruled consecutively by the Romans, the Goths and the Lombards before establishing itself as an independent commune by the 10th century. With a secure and easily defensible location and set along the well-traveled route between Rome and Florence, Orvieto thrived. After a long-standing affiliation with the papacy, the town joined the Kingdom of Italy in 1860. There are remarkable artifacts marking the history of Orvieto; ruins from the early Etruscan times include a necropolis with nearly a hundred tombs, which the town was built on, as well as what remains of the walls that once surrounded the city. The Fortezza dell’Albornoz, or Albornoz Fortress, was built in the 1350s on the site of an Etruscan temple and, after being destroyed in 1395, was rebuilt in the 15th century. There are several churches, most notably the Duomo (or Orvieto Cathedral), which includes beautiful frescoes and travertine work. Other remarkable frescoes can be seen at San Giovenale, built in 1004, the oldest church in the city. The simple but majestic architecture of the Palazzo del Capitano del Popolo, built in the 13th century as a loggia, or marketplace, the building was expanded over the years and the style of the structure has been mimicked in several structures throughout the city. However, Orvieto’s most fascinating artifact is hidden: built into the foundation of volcanic rock beneath the city is an underground maze of tunnels and passageways that were a means of escape for the noble families in the event of an attack. Visitors can take a guided tour to explore the stairways, wells, rooms and galleries, a truly unique experience. Once above ground, the best way to end a day is to enjoy a glass of the world famous Orvieto Classico dry white wine produced in the region. The dramatic cliff-side city of Orvieto is an archeological wonder and a truly fascinating spot to explore.